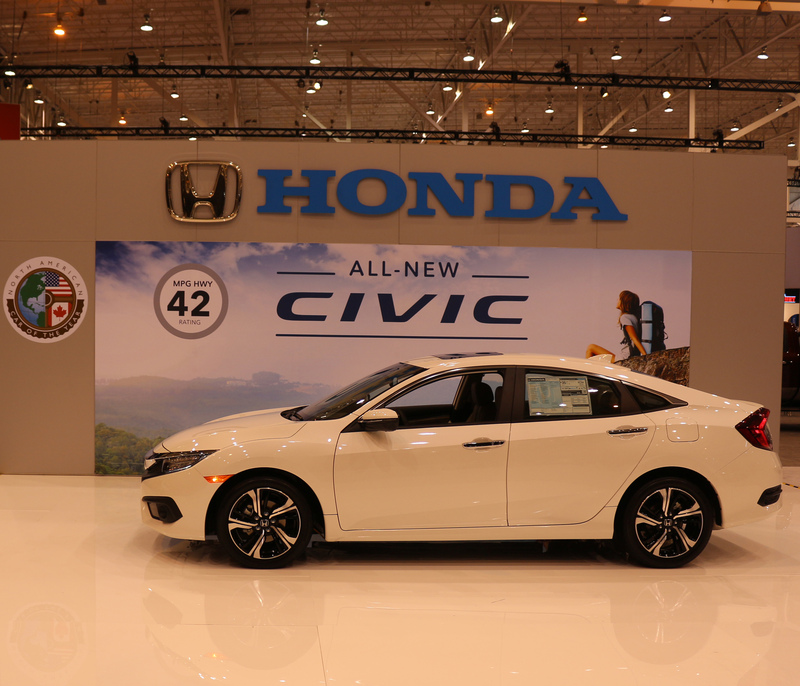 The redesigned 2016 Honda Civic is the official vehicle of the Cleveland Auto Show! The tenth generation model is completely new with a modern, sporty design, two new engines, plenty of interior changes and improved fuel economy. The largest change to the 2016 is the addition of a turbo-charged optional engine. This engine is only featured on EX-T, EX-L and Touring models. The engine produces 174 horsepower and 162 foot-pounds of torque delivered through a CVT. It achieves 31 MPG city, 42 MPG highway, for a combined 35 MPG. The Standard option is a naturally aspirated 2.0 liter engine. This comes standard on LX and EX models. It produces 158 horsepower (which is 15 more than the outgoing model) and 138 foot pounds of torque through a standard six speed manual transmission, or an optional CVT. This engine achieves 27 MPG city, 40 MPG highway, for a combined 31 MPG with the manual, and 31 MPG city, 41 MPG highway, for a combined 35 MPG with the CVT transmission. The 2016 model is also ripe with technology features. The base LX trim features automatic climate control, Bluetooth® audio and phone connectivity, rearview camera, and a 140 watt four speaker audio system. When upgrading to the EX model you are treated with Honda Lanewatch™, Pandora® Compatibility, SMS texting, Hondalink, Apple Carplay®, and Google Android Auto™, and heated mirrors . Jumping up to the EX-T model will add dual-zone automatic climate control, SiriusXM® Radio, and HD Radio™. In the EX-L trim you are treated to leather seats, power adjustable driver’s seat, auto dimming rearview mirror, and optional navigation. The new Touring model adds heated rear outboard seats, power adjustable passenger seat, integrated turn indicators and the navigation system comes standard. The 2016 Honda Civic is also the 2016 North American Car of the Year Winner! View our inventory now, and contact us to learn more about the official car of the Cleveland Auto Show! Disclaimer: 27 city/40 highway/31 combined mpg rating for 6MT model. 31 city/41 highway/35 combined mpg rating for LX & EX CVT models. 31 city/42 highway/35 combined mpg rating for EX-T, EX-L and Touring CVT models. Based on 2016 EPA mileage ratings. Use for comparison purposes only. Your mileage will vary depending on how you drive and maintain your vehicle, driving conditions and other factors.